Will Runoff From the Clearcut Affect the Lake? 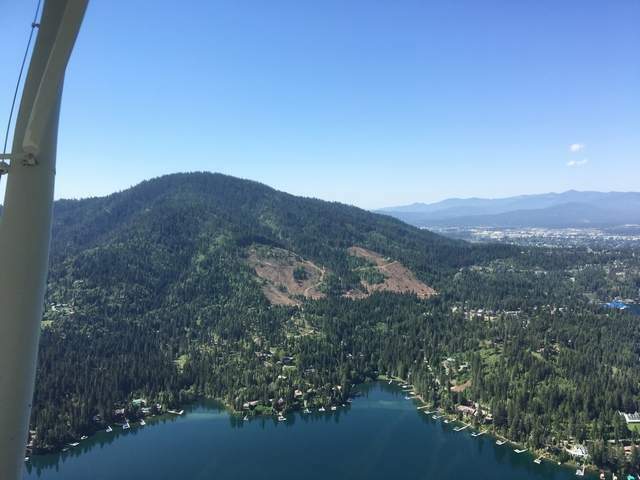 One lake resident recently asked, "Was anyone concerned about the Clearcut of a large part of Canfield Butte which will fill the creeks and lake with mud for a few years?" The rain that we're experiencing now makes me think about runoff and brings me back to this resident's question. After all, this summer saw two significant clearcuts in the watershed. The first is the one mentioned here, on the north-east face of Canfield Mountain. The second is on the north end of the lake, to the west of Hayden Creek. And I too wonder what will happen in these parts of the 'shed. Those who have more recent lake experience assure me that the dry ground will soak up all of our fall rains. We won’t see much if any runoff now. In the spring, though, we are sure to see more from snow-melt and spring rains. So how will runoff interact with the clearcut areas? In answer to the question, I’ve reposted, below, my article from the Coeur d’Alene Press. 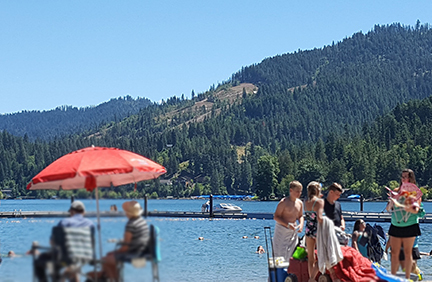 In this Jully ’18 photo from Honeysuckle Beach, you can see the west end of the clearcut. In the case of the Clarkview clearcut, though the land owner has followed all of IFPA’s best management practices required to prevent erosion, we can expect more water to run off because less precipitation will be captured by the trees. This water will carry more nutrients and some additional sediment, which will wash down the small stream that lies to the east of the Clarkview neighborhood and enters Hayden Lake’s Sandy Bay. We won’t see too much sediment in the runoff from the Canfield clearcut. Never-the-less, let’s remember that nutrient transport will take place. When we’re working hard to reduce the phosphorus loading of our lake, which we are, every little bit matters. Those are the words of Carol Maloney, a homeowner on the south shore of Hayden Lake, in response to the early May clearcut of 65 acres on the northern slope of Canfield Mountain. Many of Maloney’s neighbors were equally alarmed, and the operation has stirred up some healthy discussion, from social media to the monthly meeting of the Hayden Lake Watershed Improvement District to local kitchen tables. Jordan Redman recently purchased the now-cleared property with plans to build his family’s home there. “We wanted to do a select cut and set up a management plan to steward the forest properly,” he said. For that purpose, Redman chose Foresight Forestry “because they have a history of building a healthy forest.” Foresight diagnosed a poorly maintained forest with unhealthy hemlock trees in the stand. They recommended clearing the area and removed all of the hemlocks, leaving scattered, smaller stands of trees intact. According to Gary Hess, Forest Practices program manager with the Idaho Department of Lands, the clearcut was well-implemented: Redman complied with all of the rules required of private forest owners under the Idaho Forest Practices Act (IFPA). “There were no unsatisfactory practices that took place,” Hess said. When questioned about the potential impact on water quality, Hess reports that the streams adjacent to the cleared property remain well-protected from disturbance or debris by the required 30-foot protection zone. He also points out that in the areas where the soil was exposed, Foresight cut diversion ditches to slow and disperse the flow of potential runoff. “Additionally, a lot of understory vegetation remains, minimizing any risk of slope movement,” he said. This, then, is a story of a well-intentioned, well-done job. But is there more to the story? Forests require nutrients and water to thrive. Live trees, brush, and grasses growing in the forest pull nutrients, in particular phosphates and nitrates, from the soil. The plants return the nutrients when they die and decay. The amount of nutrients leaving a segment of forested land is very low because they are tightly bound by the life cycle of the forest vegetation. When we harvest trees or otherwise remove the established forest vegetation, we disrupt this tight cycling of nutrients. After-harvest studies, repeated in forests nationwide, have taught us that the transport of phosphorus and nitrate out of cleared areas doubles in the years following the harvest. The nutrients leave the cleared area via runoff downstream, in this case to Hayden Lake. In the lake, they are available to support added, unwanted algal growth. The greatest release will occur in the next couple of years until renewed understory growth begins to take up the slack in the nutrient cycles. As those seedlings grow, they will gradually tighten the nutrient cycle. According to Hess, “Within 5-10 years there will be a plantation growing quite well on that site.” This will gradually slow the level of nutrient out-flow until it matches that of adjacent forest-covered land. In the case of the Clarkview clearcut, though the landowner has followed all of IFPA’s best management practices required to prevent erosion, we can expect more water to run off because less precipitation will be captured by the trees. This water will carry more nutrients and some additional sediment, which will wash down the small stream that lies to the east of the Clarkview neighborhood and enters Hayden Lake’s Sandy Bay. The impact of nutrient export after clearcutting is a cautionary tale which all landowners around Hayden Lake should ponder. Those who would completely remove the natural vegetation from their lakeside lot should anticipate that their contribution of nutrients to the lake will double. Hayden Lake already receives an excess of nutrients and suffers water quality degradation accordingly. More importantly, when disruptions to the natural vegetation aren’t allowed to recover, as in lakeside clearing and road-building which are typically maintained over time, nutrient export will not gradually decrease as it does when a clearcut forest regrows. Unlike the scenic change caused by the forest harvest, the change in nutrient export cannot be easily observed. But like the scenic impact, nutrient export is not an issue addressed by Idaho’s Forest Practices Act. Property owners can, by the land management choices they make, impact Hayden Lake’s water quality. A positive impact will require making choices above and beyond what is legally required and regulated.